I used to say “no”. Now I say “FOI”. 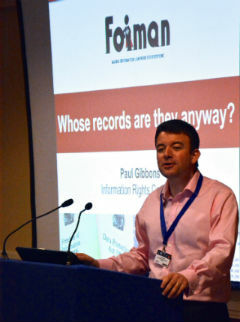 FOIMan considers whether a council handling an employee’s enquiry under FOI is unreasonable. One of the recurrent complaints made by journalists is that public bodies treat routine press enquiries as FOI requests. They see this as a way for awkward questions to be kicked into the long grass. The latest piece in this mould comes from David Higgerson who often writes about FOI on his journalism blog. 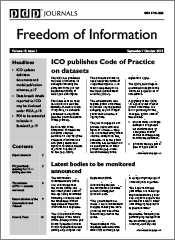 His FOI Friday thread highlighting use of FOI by local media is essential reading for journalists and others interested in how FOI is used in practice. David reports that Derby City Council treated an enquiry from an employee about its pay review approach as an FOI request. The council refused the request. The employee ended up appealing this decision to the Information Commissioner who apparently forced the council to disclose the information. David’s complaint with this is that the enquiry was treated as an FOI request in the first place, commenting that “sometimes, you just can’t make it up.” Well, I beg to differ. Obviously, if an enquiry is straightforward and there are no concerns with disclosure, then it makes sense for a public authority to treat it as “business as usual”. But even where that happens, the enquiry – if in writing – is by the definition of an FOI request at section 8 of the Act, an FOI request, and importantly, subject to the requirements of the Act. It has to be answered PROMPTLY, and in any case within 20 working days. The point I would make here is that whilst the council appears to have made the wrong decision in respect of whether or not to disclose the information, it is not handling the enquiry under FOI that has caused this. In fact, FOI’s role here has been to allow the employee to successfully challenge the council’s refusal to disclose the information. In other words, without FOI, the employee might never have received the information he wanted. I do think this is an important point. 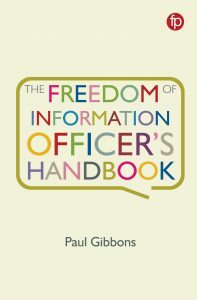 Whilst the timescales in FOI might not be to journalists’ (and indeed others’) liking, the fact of FOI’s existence has led to, and will continue to lead to, information reaching them that would never have done before FOI became law. Before FOI, Derby Council’s employee would never have been able to find out how he and his colleagues’ pay was calculated. And journalists would have had no way to force the release of information that public authority Press Officers were unwilling to provide freely. No doubt Press Officers do tell journalists to use FOI when they don’t want to tell them something. And HR departments may well do the same when they have a concern about disclosing information to employees. Before FOI they’d have just said “No”. Hi Paul, thanks for the link. I take your point that before FOI they would have said no, but I think it runs a bit deeper than that. In the case of Derby, I still find it remarkable that someone is forced down the FOI route when asking for information about their terms and conditions. Of course, it’s better that they have the FOI route to go down than not, but it’s a shame they have to use it. On the press office, I’m not sure whether FOI improves the situation or not. ‘Refused to comment’ is a powerful phrase many press officers avoid at all costs – FOI provides a helpful halfway house to delay a story while not refusing to answer it. Thanks for responding. My understanding of the Derby case (IC decision notice FS50527292) is that it wasn’t terms and conditions they were after, but details of how posts were graded. It was fairly common practice in the early days of FOI for that to be withheld as most public bodies used a commercially produced methodology to calculate this, and there was a perception that the company (the Hay Group) responsible would not wish it to be made public. Over time, decisions of the ICO (not to mention the company concerned saying that it had no objection) have changed that view, but it is not hard to imagine a HR Manager at Derby not being aware that things have changed from when they were first cutting their teeth in personnel management. They were wrong to refuse the information, but it’s an understandable mistake, especially if made by someone without much experience of FOI. I do agree with your suggestion that sometimes people drag their feet over answering questions, and will often cite FOI when they do. Obviously that happens. But I would just suggest that it has little, if anything, to do with FOI – those people/authorities would drag their feet whatever legal frameworks existed. It’s sad that they give FOI a bad name, but the delays have more to do with their agenda than any requirements of FOI. If a journalist calls a press office for a comment and doesn’t get one, then it’s ‘no comment’: FOI doesn’t apply. If they send an email asking for a comment and don’t get one, it’s ‘no comment’. If any organisation tries to use the ‘FOI’ line to deflect a request for a comment, it’s probably an abuse of the legislation. But the onus should be on the journalist to make clear what they actually want – I’m asking for a comment now, or I’m making an FOI for information that I understand I will receive later. If you don’t want the “halfway house” of a legally constructed right to request information, pick up the phone. You also get journos who ask under FOI and then try to force the process by bullying FOI Officers/organisations. We personally have had a request recently, received on a Tuesday morning from a national Sunday newspaper making a request under FOI. The journalist then chased the request on the Tuesday afternoon saying if we didn’t respond by the Thursday so they could publish on the Sunday they we state we refused to respond. That the information requested was reasonable complex to obtain (albeit within the cost limits) and was potentially exempt didn’t seem to matter. From their perspective unless we gave them what they wanted we obviously had something to hide. The fact is it is a 2 way street and a bit of co-operation on both sides goes a long way. For what its worth the story never appeared either, so much for its urgency! For what its worth we have drafted a response but not yet finalised it (we are well within the 20 days). *WOULD state obviously, not WE!